In writing to Donald Tusk to ask for yet another Article 50 extension, Mrs May refers to the current impasse creating uncertainty which is "doing damage to faith in politics". Long before we got to this current situation, though, politics was in a parlous state - and there is no better illustration than yesterday's by-election in Newport West. As I remarked in my previous piece, Ruth Jones's victory gives Mr Corbyn's party one extra vote, while Jones herself gets a direct say in the proceedings in parliament, supposedly representing "her" constituents in Wales. But, if we look a little closer at the election result, we find that Ruth Jones won her seat with 9,308 votes, representing 39.6 percent of votes cast, on a turnout of 37 percent. However, when expressed as a percentage of the 64,399 registered voters (2017 figures), that works out at 14.5 percent of the electorate. Less than one in seven of those entitled to vote actually supported this candidate. It is also the case that the combined votes of the Conservatives and Ukip exceeded, by a small margin, the winning vote. Assuming for the purposes of argument that all the votes which went to Ukip (represented by Neil Hamilton, a former Conservative MP), would have transferred to the Conservatives in the absence of Ukip, the Conservatives would have won the seat. That is more so given that there were a number of Ukip "splitters" whose votes, theoretically, could have gone to the Conservatives. Ms Jones will undoubtedly say that she goes to Westminster to represent all her constituents, but she goes there supporting the idea of a "confirmatory vote", welcoming "an extension until June to give us time to get things together in a more orderly and secure way is better rather than a 'wham bam' we're going to fall off the precipice today". In fact, though, Newport West is a "leave" area and with a mandate of a mere 14.5 percent, Ms Jones has no right to assert that she represents the people of her constituency and nor, on Brexit, does she. She is simply reiterating the Labour mantra, on whose platform she hitched a lift to get her a new job in London. Oddly though, as the newest member of a failing system of representative democracy, she is supporting a reversion to the oldest form of democracy in existence – direct democracy, where the "will of the people", all the people, decides key issues. She would have us all vote on whether to accept the Withdrawal Agreement negotiated by Mrs May, a stance which, in principle I could support. The problem comes if this is turned into an excuse for a re-run of the 2016 referendum, and it becomes a choice between the deal or staying in the EU. Even a choice between deal and no-deal would be problematic, so the only way there could be a strictly neutral question is to ask voters whether they supported or rejected the deal, inviting a straight "yes" or "no" answer. The consequences of each choice might then be left for the campaigning groups to explain, except that we have a real problem there. The former discredited Vote Leave organisation could hardly be reactivated for any campaign, much less Arron Banks's tawdry Leave.eu grouping. In any case, both leavers and remainers might support the deal, which suggests that the official campaign groups could not rightly be split along those lines. We would virtually have to start from scratch, which brings home the practical difficulties of organising referendums in a nation which is unused to them, with a media that treats them in the same way it does elections. The one small consolation of this is that if the media turns this into a personality contest, I could well find myself voting against Mr Johnson and Jacob Rees-Mong, which would present me with no problems at all. And I suspect that Mrs May is far more popular in the country at large than she is in the Westminster bubble, and could well prevail in a straight fight against her critics. Before we even get there, though, Mrs May has to confront the hurdle of the European Council on Wednesday, and she has done herself no favours at all in going for the 30 June option which has already been rejected. 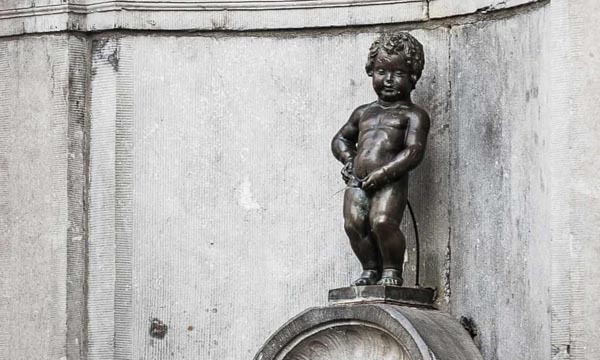 The "colleagues" might take the view that she is emulating a certain statue in Brussels, which was recently discovered to be discharging hundreds of gallons of fresh, clean drinking water down the drain each day. That it is now reusing the same water is perhaps highly symbolic, given Mrs May's penchant for returning to the same ideas, again and again. Both are now in the recycling business. To add to her problems, in her letter Mrs May makes much of her talks with Mr Corbyn and her hopes of agreeing "a proposal that can be put before the House of Commons which allows the United Kingdom to leave the European Union with a deal". All the indications are that this initiative is foundering and, by Wednesday, it will be in the ground dead and buried – as was always going to be the case. That effectively robs Mrs May of her last claim to have anything approaching a coherent strategy, and the single thing that the Germans had focused on as a "positive element" in the prime minister's letter. This makes the French view all the more powerful, where the official stance is that it is up to the UK to present an alternative plan in the coming days - whether new elections, a second referendum, or a proposal for a customs union - otherwise the country would leave the EU with no deal. France's secretary of state for European affairs, Amélie de Montchalin, then says, "The European council took a clear decision on 21 March … Another extension requires the UK to put forward a plan with clear and credible political backing". In the absence of a plan, she says, "we would have to acknowledge that the UK chose to leave the EU in a disorderly manner". The French ambassador, apparently, takes an even sterner view, insisting that there was no justification and only danger in another extension. With the talk then of giving the UK only a couple of weeks, enough only to get its legislation in place, Donald Tusk becomes Mrs May's one hope of salvation. He seems to support the idea of a long "flextension", which would give us a stay of execution. Nevertheless, no-deal is definitely looking to be the most likely scenario, where France, Spain and Belgium are joining in taking a hard line that what will be will be. Patience in Paris has long run out, and the contagion is spreading. Even the UK's closest ally, Dutch premier Mark Rutte is wobbly. He wants "more clarity" from London before Wednesday. For all that, between now and Wednesday lies an eternity in political terms. With the situation changing by the hour, no sooner has one line been settled upon than it seems to change, ruling out any attempt at serious analysis – much less prediction. We are almost in the territory of Gerry Anderson and his Thunderbirds, where "anything can happen in the next half-hour". None of this, of course, is of any help to the besieged denizens of Westminster who, we are told are undergoing "a collective breakdown" as the stress of the Brexit crisis tips dozens of exhausted MPs over the edge. Deputy Speaker Lindsay Hoyle has written to all MPs to urge them to seek help from Westminster's mental health services, including a confidential 24 hour counselling phone line, while Education Committee chair and former Tory minister Rob Halfon observes that, "People are behaving in ways that were unimaginable even just a year ago, whether they be remainers, leavers or in-betweens. The Brexit madness has affected us all". The lack of sympathy from the real world is almost palpable, especially as the collective has variously tried to vote a no-deal out of existence and to instruct the prime minister to secure an Article 50 extension that doesn't lie within her gift. Yet, even the Financial Times is getting in on this act, reporting that MPs have said the Brexit gridlock in parliament has left UK politicians "visibly struggling" as concern grows they are too "mentally exhausted" to make vital decisions affecting the nation's future. Arguably, it is not the exhaustion, mental or otherwise, that has affected their decision-making capabilities, but their incompetence compounded by ignorance. People who have not taken the time out to acquaint themselves with the basics were always going to struggle when they were confronted with real-life issues. Nevertheless, Phillip Lee, a Conservative MP and practising GP who last year resigned as minister to campaign against Brexit, said he has concerns for those "visibly struggling" - in some cases with anxiety and depression. "There are MPs who have snapped in what has become a pressure cooker environment", he says. "You've seen tears, anger and arguments between colleagues, most of whom are simply exhausted". Never mind, of course, those thousands of businesses which are struggling to make plans for the future, and the hundreds of thousands of individuals who have had their lives blighted by uncertainty and indecision. We must extend our sympathies to the bleeding heart MPs, to whom we all owe so much. But, if they think they have it tough now, wait until they go out canvassing during the next general election campaign. If Ruth Jones's experience is anything to go by, it won't be mental health counselling they need, but police protection.